There are good lakes, there are better lakes, but none but these are Great Lakes. Do you still remember the mnemonic device for naming all five lakes? * Here they are: Superior, Michigan, Huron, Erie & Ontario. These are the Earth's largest group of freshwater lakes, the "Third Coast" of the US, and home to some of the most beautiful places I know. 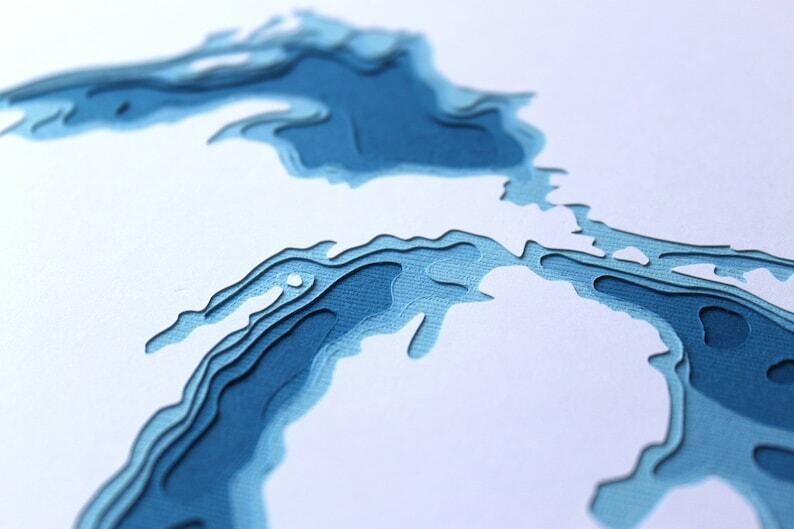 This is an original, layered papercut piece, handmade in Minnesota, in a deliciously rich set of Royal blues, and featuring the chain of the five Great Lakes. 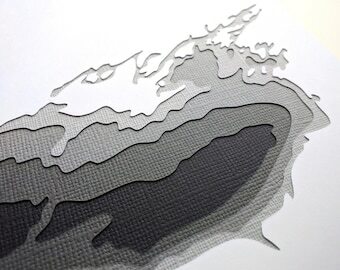 This unique piece is intricately cut from five layers of high quality, acid-free cardstock. The top layer is a bright white, while the layers underneath are in ever-darker shades of color. Because this piece is handmade, it will differ very slightly from piece pictured here. The back is titled, signed and dated as an original piece. The work measures 8 x 10 inches (about 20 x 25 cm), and is about 1/8" thick. It will be sent to you carefully wrapped and supported to ensure it arrives safely. Like the piece, but prefer a different color? Check out the fifth photo in this listing for all available color sets and be sure to mention your color choice in the message to seller upon checkout. Larger quantities are available! Just contact me here and I'll hook you up! 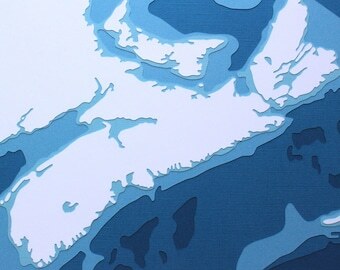 The quality and look of my Great Lakes papercut is exactly what I wanted. The seller was great to work with. She answered my questions and shipped my item very quickly and professionally. Beautifully done. I received it really fast. I would definitely recommend. Beautiful piece, shipped very fast!